Losing Control is a move that allows you to easily bring a selection to the top. "So simple, yet so brilliant!" - Dave K.
How long have you been practicing a move like the classic pass? It's been over twenty years, and Lee is still working on his! One day he will master it, but until then, the Losing Control is his preferred way to control a card to the top. This clever maneuver gives you the ability to have a card selected, plainly and cleanly placed back into the middle of the deck and yet have the card secretly remain on the top of the pack. The Losing Control technique does not rely on packets transposing under the cover of heavy misdirection or sweeping hand gestures. The method is effective, bold and economical. Therefore, if you're someone who wants to master a slick and efficient card control, without spending a lifetime pursuing it - The Losing Control is for you. Besides detailed description and photos you will have access to five instructional video clips (either by clicking through to Lee's website or by downloading the zip file with the video clips inside from your Lybrary.com digital shelf). Introduction: Many experts, both right-handed and left, consider this simple manipulation to be one of the shrewdest and most direct card controls ever designed. History: The basic handling of the Losing Control was conceived in Las Vegas, Nevada during the summer of 1996. Later, after researching the idea further, the concept of using a reversed spread to control a card finally surfaced. Now it's your turn to learn its entire lineage. What's a Reversed Spread: It's important to understand the difference between a regular spread and a reversed spread. This section details those differences so you can start taking advantage of this lesser-known principle to fool those around you. The Losing Control: The Basic Handling: Learn the basic handling of the Losing Control. This move will allow you to spend more time dealing with your presentation rather than worrying about bringing the selection to the top. Have comfort in knowing thousands of people have been fooled by it. Alan Ackerman Addition: Las Vegas Card Expert Allan Ackerman offers an idea that further convinces everyone the selection is still in the center of the deck. Tabled Version: To add another dimension to the Losing Control, you can perform it as you spread the deck on the table. It looks so fair, it will convince even the most skeptical audience member. Vertical Handling: The basic handling of the Losing Control leaves a powerful picture in the mind of your audience. However, you can make it even stronger with the vertical handling. 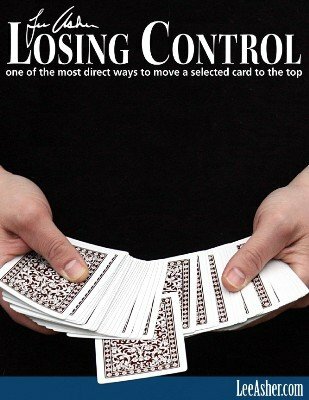 Final Notes on the Losing Control: If you aspire to use the Losing Control as one of your main controls, understanding these fine points will guarantee your success. This section deals with subjects like No guts, no glory, Visualize & scrutinize, Control with your eyes, and Ixnay on the Ambitious. These thoughts that will help you become proficient with this powerful sleight. 1st edition 2010; 22 pages photo illustrated plus 5 instructional video clips. Which scenario seems less suspicious and more direct for secretly positioning a selected card to the top (or bottom) of the deck: Simply having a selected card pushed back into a deck, or having a selected card pushed back into a deck and then having the magician shuffle off (or fiddling with the deck with both hands for no apparent reason)? If you said the first scenario, then Losing Control might be just what you’re looking for. While it certainly passes my Erdnase Test, “. . . the most critical observer would not even suspect, let alone detect, the action,” like the Pass, Losing Control does require (and for me, the fun part) a brief moment of misdirection. However, the handling is much more subtle and elegant than either a Pass or Shuffle Control, yet it still meets the purpose of both while trimming away any extraneous fiddling or finger fluttering. In essence, it directly, seamlessly, and secretly places a spectator’s (if you wish, signed) selection on top of the deck before (in their mind) the trick has even begun -- a powerful place to be. 1) Clarity. Losing Control was created with the reader in mind. It is professionally laid out and pleasing to the eye, has plenty of white space for notes at the bottom of each section (if you decide to print it out), and is easy to read in a (mostly) 11 point Ariel font. The photos are crystal clear and their corresponding instructions are on the same page, so no need to constantly page up and down. The .PDF also includes small sidebars of pertinent information and, for the viewer, five embedded video links. 2) Video Section. I particularly like the video link section so that I can literally see the instructions in action. The sleight is powerful because of its brazenness. It’s out there for anyone to see BUT ONLY IF THEY’RE FOCUSED ON IT. (That’s why -- like a Pass or Shuffle Control -- it should only be done in the expository phase, allowing for time misdirection.) In fact, because it’s sometimes hard for me to think like a spectator anymore, I found that if I glance away at the crucial moment (you’ll know when) as when properly misdirected, the experience is simply jaw-dropping. Doing this can help to give you the confidence and timing for when and how you decide to make use of this elegant sleight. 3) Brief yet thorough. At only 22 pages (including photos) Losing Control completely covers the control without being too wordy. It is broken into easy-to-digest sections, including a concise-and-helpful introduction, brief history, and clear methodology. It includes a dynamite convincer from Alan Ackerman, two variations (one for use with a table and one for allowing the spectator to see all the card faces at eye level), and Mr. Asher’s personal tips for the control. Mr. Asher wraps it all up with proper credits and interesting tidbits, thank you’s, and thoughts on how to proceed. 5) Additions and Variations. The Alan Ackerman Addition provides another subtle layer of conviction; the card is on top of deck before the “selection” is pushed in. The tabled version gives an innocent hands-off feel, and the vertical version is suitable for standing venues. PERSONAL TIP: Having read and understood the differences between a regular and reversed spread, I have found that it is also possible to control a selected card to the BOTTOM of the deck by reversing the process. NOTE: Mr. Asher admonishes the reader to not be eager with using the control for an Ambitious Card sequence. I tend to agree. This move is like seasoning -- a little goes a long way, but too much ruins the dish. It is a little-known sleight, and I prefer to use it sparingly. I do confess, however, that I love using it once in my own opening sequence of David Regal’s AC routine. NEGATIVES: In one place Mr. Asher writes about the control as if the reader will become nervous executing the move. For me, this seemed a bit presumptuous. However, for those who would have been nervous anyway, Mr. Asher continues with how to overcome any possible jitters. Also, I wish I were the only other person who knew about this. Thus, Losing Control eliminates the need to yammer on and on (not unlike this review) just to cover any shuffle control or to pointlessly bring one’s hands together just to execute a pass. It is fast, it is fun, and it efficiently and innocuously places the spectator’s selection on top of the deck before the trick (in their mind) has even begun -- without all the fiddling -- and at a reasonable price. The first time you see the demo video, you wonder where the sleight is. I din't see anything unusual. The second time you might notice, that the handling looks a little strange. When you look again after reading the description you will say: This is never going to fool anybody! But it just did! With the Ackerman Addition it is even more convincing. This is a daring move. But the explanation and the fotos are very clear and easy to follow. The videos give you a clear picture of the timing and flow. It will take some work to make it look smooth and natural, but it should be within reach of anybody. This is a very deceptive way to control a selected card. It is not difficult to do and the explanations are very clear. When I watched the video, it did not fool me at all. But when I learned the moves I tried it on my wife, the "Oh NO! Not another card trick?!?" type of audience. She was absolutely fooled. It took her several times before she caught on and felt foolish for not seeing it at first. I applaud Mr. Asher for his insight and downright brazen approach to bringing a card to the top of the deck. This is the most amazing control I have ever learned. I was familiar with the back spread from performing "The Virginia City Shuffle", but had never even thought of back spreading a whole deck. This is my go to move now for controlling a card to the top of the deck. As always Lee Asher has nailed it and again shows why he is an Einstein of card magic. Watching performances of this had me completely baffled. It blew right past me every time! So, I bought it and was at first rather shocked it had taken me in so completely. I tried it a few times, and thought I had it down. However, the first person I showed it to wasn't fooled at all. Before I had a chance to finish the trick, he said "my card is on top!" Yikes! Back to the woodshed! As it turns out, this is one of those "moves" that relies more on smoothness, choreography, and confidence than anything else. Once I understood a couple of key points that Lee covers well in the book, it became (and remains) a favorite of mine. If it seems over-priced, remember that it includes links to 5 short videos where most books use photos. This is a very clever move from one of the great minds in magic today. Lee Asher puts out some of the best effects and utility moves you can get. I have nearly all of his PDF's and dvds. All quality stuff and Losing Control does not dissapoint. If you are a beginner, you can do this and the experts can appriciate the simplicity of this great control. Buy it, you cant go wrong.